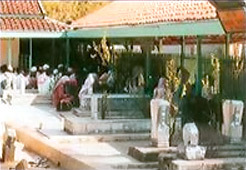 This tourism object is a pilgrimage object visited by many tourists out of Madura Island. It’s part of a series of Walisongo tour as form of vow of the poor farmers who have been successful. It’s located at Badung village, Proppo district, about 12 km from Pamekasan city.